In the early morning hours of February 8, 1855 a heavy snow fell across Devonshire in southwest England. In the 19th century travel was limited and most country folk did not travel at night especially in the cold and snow. So when the residents of Devonshire awoke on the morning of the 8th they were surprised to seen thousands of mysterious footprints in the freshly fallen snow. These odd tracks were not only seen on the ground but trailing across housetops, leading up walls and even more strange leading up and down drainpipes. Witnesses noted they seemed to walk right through walls and haystacks appearing on the other side. One set was tracked across a two-mile estuary. Most disturbing of all was the appearance of these prints. 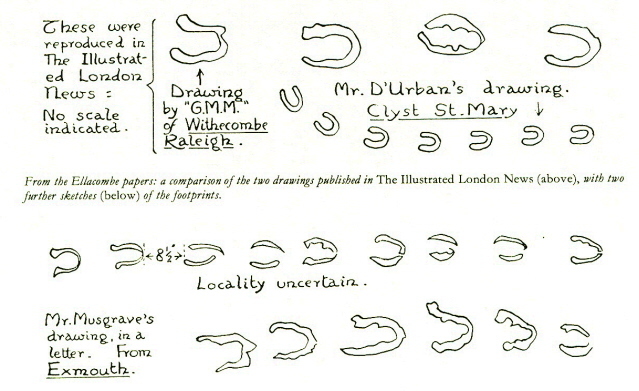 They looked like clearly defined cloven feet. They also were sunk deep into the snow. Some descriptions mentioned they appeared to be burnt into the snow with a hot iron. People started to question what could have created these prints. Many began to wonder if the Devil himself had visited Devon. Various clergymen followed up with announcements that the Devil was roaming the countryside for sinners. The Devil rumor spread like wild fire and people now afraid began to lock their doors at night. In order to calm the populace, investigators dismissed the Devil theory and tried to come up with a more credible explanation. There were so many witnesses to this strange phenomenon that no one ever disputed it actually happened. But since it was disturbing investigators immediately put forth several theories. One common theory was that a bird or animal made these tracks. The problem with this was no prints like these had been seen before or since this incident in 1855. People noted no animal could have kept to a straight line for the long distances made by these tracks. Another theory put forth was that wind or atmospheric conditions left these prints. But this fails to explain the precise directions these tracks made or the fact that each print had a clearly defined shape. 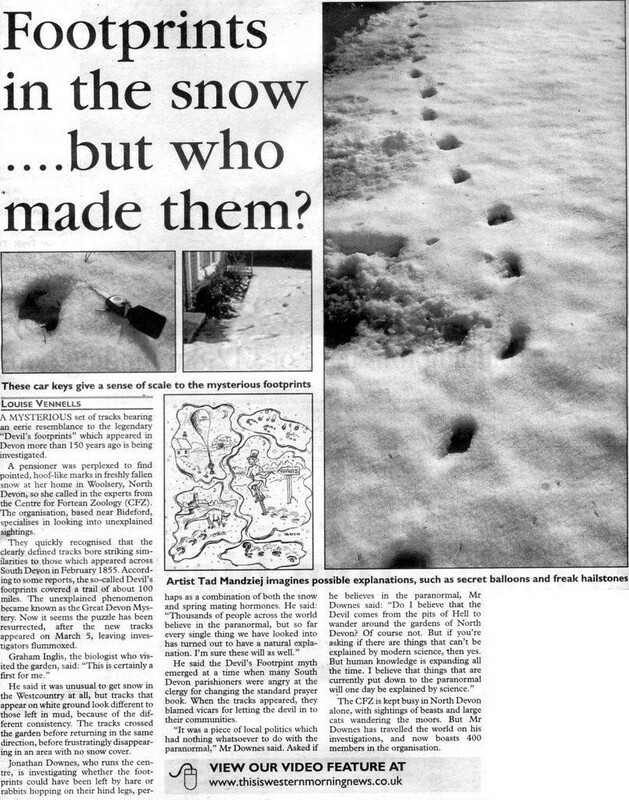 If the weather was the cause, then people questioned why these prints were only seen in Devon. Others stated that these prints must have been a hoax. But no humans in 1855 could have managed to cover an almost hundred mile area in one night. Let alone do it in total darkness and in the freezing cold. 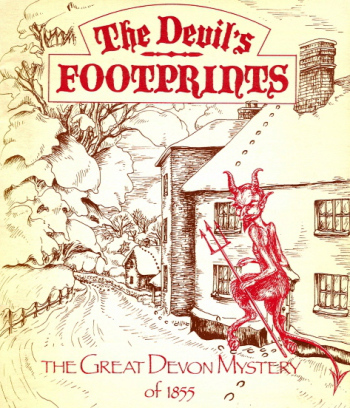 In an attempt to knock down the Devil theory one group even speculated a Kangaroo that escaped from a private zoo near Sidmouth caused the prints. But a Kangaroo's tracks look nothing like what was left in the snow. It has been over 159 years since these prints were seen and they still remain one of the strangest unsolved mysteries in the world. The moors in Dartmoor cover 368 square miles. This area located in the South Devon countryside in England is considered to be one of the spookiest places on earth. These moors misty bleakness and changeable weather conditions are most likely responsible for this reputation but because of this the area has inspired an incredible assortment of myths, legends and ghost tales--notably Arthur Conan Doyle’s The Hound of The Baskervilles. In future, I will share more of these tales. 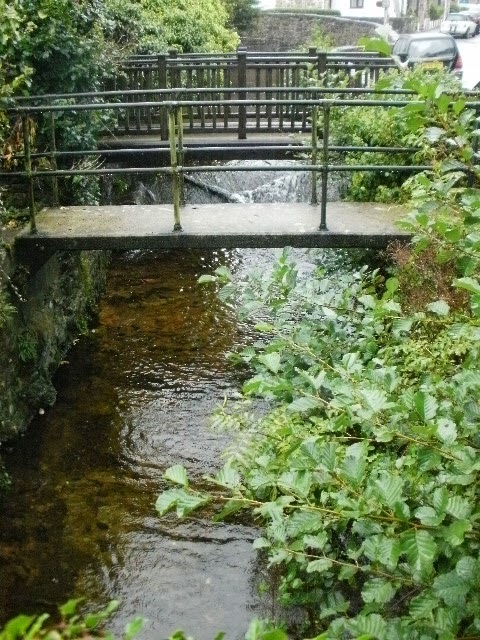 One myth told by the locals in the town of Ashburton that sits on the border of Dartmoor is a cautionary tale told to children and drunks to warn them about misbehavior and being too close to water. The story of Ashburton’s Cutty Dryer--sometimes spelled “Kutty” is its most popular myth. Cutty Dyer is an evil little water sprite or ogre that lives under bridges along the Yeo River. One version states he is seen near Williams Crossing and the town hall in Ashburton. Generations of this town’s “naughty” children have been warned to keep away from the Yeo or Cutty Dyer would cut their throats and drink their blood. Stories about this ogre state he has no fondness for drunks. It is said persons that are inebriated fall victim to the same fate. One account given of Cutty Dryer was published in the “Devonshire Association of Science, Literature, and Art in 1879. 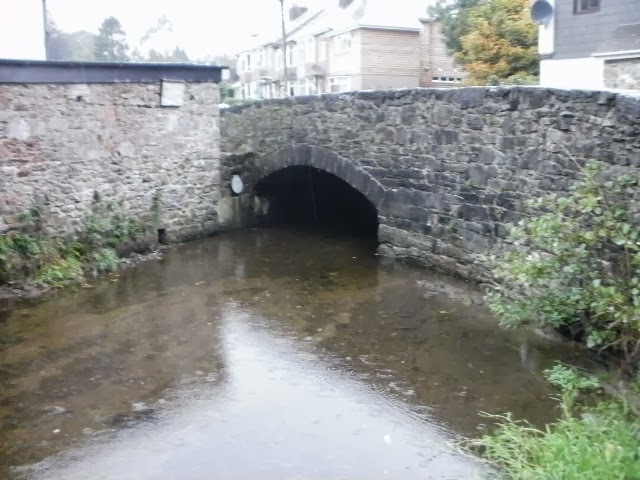 “Old Townspeople of Ashburton recollect well the dread of their lives when children, was a mysterious being supposed to inhabit the river Yeo, with whose displeasure and its undefined consequences they were threatened by parents and nurses as a punishment for disobedience and childish frolics. This account went on to describe what Cutty Dryer looked like. “He was described by persons who saw him as being very tall, standing in the water to his waist, with red eyes as large as saucers, endeavoring to pull them into the water. When the stream was bridged he remained only a scare to children, and on the streets being lighted disappeared altogether. Two adult witnesses encountered Cutty Dyer at William Crossing late one night. The two men were walking along the bank of Yeo when they saw an ogre with “great goggle-eyes, black hair hanging over his shoulders in twisted snake-like locks, a beard of the same color, and teeth like a shark. Luckily, these two were able to escape unharmed. This story is still used today in Ashburton as a warning. 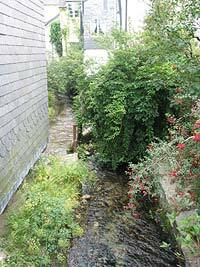 In one recent BBC interview the town clerk, John Germon notes that this story worked, for he and his friends when young were so afraid of the water sprite that cut children’s throats they stayed away from the area. In another post the tale of La Llorona, is shared. This legend that is told in New Mexico--is also used to warn children to stay away from water. How La Llorona is used to warn children to behave can be found here. Lafcadio Hearn wrote one of his most popular books, Kwaidan: Stories and Studies of Strange Things just before he died in 1904. 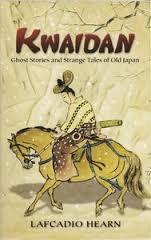 This book is better known today by just the title, Kwaidan, which means “Ghost Story” in Japanese. Hearn in his introduction to the first edition of this book explains that most of the 17 ghost stories he includes he translated from old Japanese texts. A long time ago a merchant who lived in the rural province of Tamba had a daughter called O-Sono. O-Sono’s father observing she was both pretty and clever decided to send her to Kyoto where she could be trained in the polite accomplishments taught to young ladies in the capital. After O-Sono finished her education she married a merchant named Nagaraya who she lived with happily. The couple had one child--a son. Sadly, O-Sono in her fourth year of marriage fell ill and died. On the night of his mother’s funeral her son announced to the rest of the family that he had seen his mamma upstairs. She had smiled at him but had not said a word. Becoming afraid he had run away. Some of the family then went upstairs to O-Sono’s room. By the light of a small lamp they were startled to see the figure of the dead mother. She was standing in front of a tansu, a chest of drawers, which still contained her clothes and ornaments. Her head and shoulders were seen clearly but from the waist down her figure faded into invisibility. Afraid now too, the family members left the room. They consulted together downstairs. O-Sono’s mother-in-law stated that maybe she was so fond of her things she could not bare to part with them. She suggested they give O-Sono’s belongings to the parish-temple so that she could rest in peace. The family agreed and the drawers of the chest were emptied quickly and the items were taken to the temple. But O-Sono’s ghost came back the next night, like before she stood before the tansu. She also came back the night following and the night after that, in fact, she returned every night-- leaving the household in fear. The mother-in-law then went to the chief priest at the Zen temple and asked what could be done. This priest a very old wise man felt that there must be something O-Sono was anxious about either in or near her tansu. The mother-in-law insisted the chest was empty. The priest promised to come to the house that night and keep watch in the room. When he arrived he announced it would be best if he kept vigil alone. When O-Sono appeared he noted she had a wistful look and her eyes were fixated upon the chest. The shadowy figure appeared to give her consent with a slight nod of her head. The priest then went through each of the four drawers but found nothing. He noted the figure continued to gaze wistfully at the chest. It suddenly occurred to him that there might be something hidden under the paper which lined each drawer. He searched the chest from top to bottom. In the last drawer he found--a letter. “Is this the thing that troubles you?” O-Sono’s gaze fixed upon the letter. “Shall I burn it for you?” O-Sono then bowed before him. The figure then smiled and vanished. The letter was a love note O-Sono had written during the time she studied at Kyoto. The priest burned it and her secret died with him. 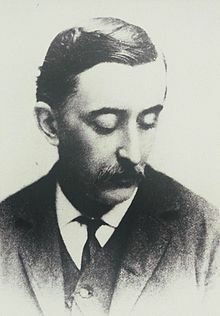 In Part l of Lafcadio Hearn’s A Dead Secret I share more information about him and his writing. 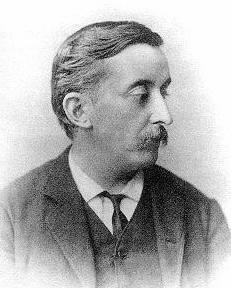 Lafcadio Hearn’s flight from Western materialism brought him to Japan in 1890. He became a Japanese citizen taking the name--Yakumo Koizumi--and married the daughter of a samurai family. He was born on the Greek island of Lefkas in 1850. His father was an Anglo-Irish surgeon and a Major in the British army. His mother was Greek. At age 6 when his parents divorced, Hearn went to live with a great-aunt in Dublin, Ireland. At age 16 he lost the sight in his left eye and soon after his father died. Hearn was forced to leave school when his aunt declared bankruptcy. At 19 he moved to Cincinnati, Ohio where he became a newspaper reporter. In 1877 Hearn moved to New Orleans where he lived for ten years and continued to write--specifically a series of articles. He gained success with his literary translations. Harper Publishing Co. sent him on assignment to the West Indies from 1887-89. He wrote two novels during this period. In 1890 he decided to go to Japan where he befriended Basil Hall Chamberlain. At Chamberlain’s encouragement he taught English at a middle school. He married and taught at another middle school where he wrote his book Glimpses of Unfamiliar Japan published in 1894. He then secured a journalism position with the English-language Kobe Chronicle. With Chamberlain’s assistance in 1896 he was given a position at Tokyo’ s “Imperial” University where he taught English Literature. Hearn’s most famous books include: a collection of lectures entitled Japan: An Attempt at Interpretation, 1904, Exotics and Retrospectives, 1998, In Ghostly Japan, 1899, Shadowings, 1900, Japanese Miscellany, 1901, and Kwaidan, 1904. He died in 1904 at the age of 54 from heart failure. 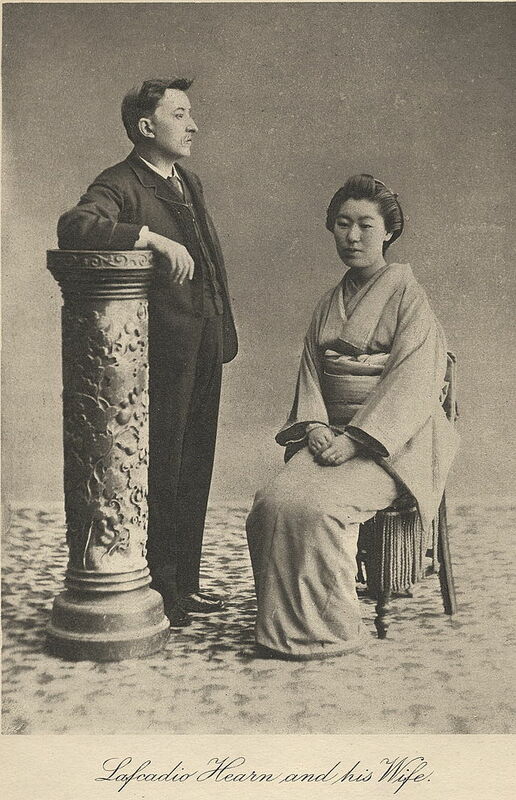 Hearn with his wife Koizumi Setsu. Hearn admired Japan for its beauty and tranquility. He loved its customs and values. A confirmed “Japanophile” he lived there the rest of his life. Lafcadio Hearn’s artful translations of traditional Japanese Ghost stories are why they are known outside of Japan today. In Part ll of Lafcadio Hearn’s A Dead Secret, I share one of my favorite ghost stories translated by him in his book, Kwaidan. Do Young Children see Ghosts?